George, Mitchell, Annie; Werewolf, Vampire, Ghost. Is being human a matter of genetics, or a state of mind? A vampire, werewolf and ghost, sharing a flat in Bristol, and trying to blend into society, investigate. Sort of. Being Human, created by (“School Reunion”/Doctor Who & “Greeks Bearing Gifts”/Torchwood genius) Toby Whitehouse, delivers us an amazing mix of drama, comedy, spooky supernatural and a dash of horror. Through the eyes of the no-longer-human, his amazing three leads and an array of important supporting characters, take us on a journey of what it is that makes us human, as they endevour to return to normality in their forever-altered lives. Is being human simply a matter of genetics? Or does it count on wealth of life, social interactions, relationships, work, play and death? This may sound like a heavy topic, but it’s presented in such a fun, naturally clever way. For example, we’ll go from an intense discussion on why they aren’t communicating, quickly segueing into exasperation in the time for Hu$tle being switched on them that week. Let me borrow a leaf out of Nate’s posting style, and introduce the trio that make this show work so well. Mitchell (Aidan Turner). Vampire, and a popular one in the Bristol vampire circle (headed by Herrick – Jason Watkins). Mitchell is officially ‘on the wagon’ – suppressing the vamp urge to feed, in his efforts to become a member of society again. George (Russell Tovey). Werewolf, Mitchell’s best friend, and all around OCD genius. Constantly on edge and living in fear that the public will find out about them, George is ashamed of his ‘condition’ – he can’t just ‘quit’ being a werewolf. Like clockwork, at his time of the month, he transforms, whether he likes it or not. Despite this rather foreboding character description, some of the funniest moments come care of George. Bless him and his little furry paws. Annie (Lenora Crichlow). Ghost, who haunts the flat they share (it was the scene of her death). Once Annie realises that people of the supernatural world can see her -well, you can’t help but love her. She’s like everybody’s little sister. Her trademark is making excessive amounts of coffee and tea – not that she can drink it – but she likes the process of making tea. I know there’s a lot of supernatural media out there at the moment – particularly vampire-related media. Being Human isn’t just another vampire story. It’s the story of three wonderfully funny people/friends, making the most of their (unfortunate?) situations. 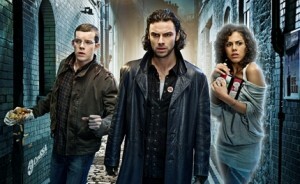 Being Human: Season One and Season Two are both available from Amazon. Woot! So glad to hear this got renewed 😀 It satisfies my love of the speculative genre presented in a thought provoking manner as well as a dash of fun. Highly recommend this show to people who love the supernatural and are interested in the exploration of human nature by those where it would be easiest to casually dismiss them as not human.